I'm not too surprised, but ironic, since I'm often decried as leaning too far one way or the other. Guess some things change and some things remain the same/are reinforced over time. That is a fairly big shift leftwards Suke! Any big things impact that or just gradual change over time? Sun Fin wrote: That is a fairly big shift leftwards Suke! Any big things impact that or just gradual change over time? Good question! Not sure there's a singular answer though. Perhaps just getting older and more empathy. Just out of curiosity, do you consider empathy to be a trait of the left? Or do you mean being a centrist (like your former position) is comparatively unempathetic? Jia Nanfeng wrote: Just out of curiosity, do you consider empathy to be a trait of the left? Or do you mean being a centrist (like your former position) is comparatively unempathetic? That's a fair question, the simple and short answer is yes, but I'm sure its more nuanced than that. I never doubt there are people on the right, or at least right from where I appear to be, who most certainly have empathy for their fellow man. But as I've aged I have tended to believe the methods of the left are more empathetic. I've always been (I believe at least) an empathetic person, but as a centrist my views often tended to leave people to their own fates and lack the empathy. I think both sides are empathetic, but direct their empathy towards different areas. It may be that the left declares support for areas or groups that you also happen to support. In a situation like that, it's easy for us to presume empathy is more pronounced or even exclusive to our side. Dang, man! Sun_Fin took the words out of my mouth. Yeah, I've definitely gotten radical as I've gotten older, so I can sympathise there. Empathy? Hmmm... 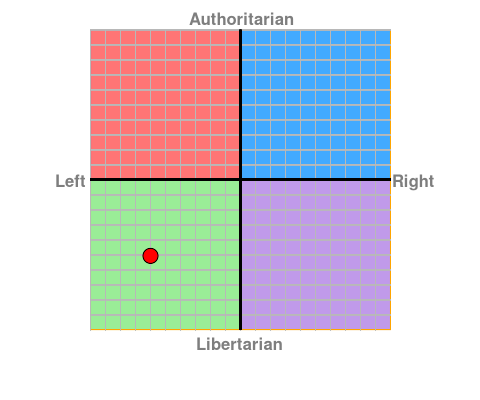 I know enough conservative people that I wouldn't call them lacking there, but there does seem to be disconnect between their personal comportment and the policies / people they support. I think that's a much betterway to put it. Mine seemed more loaded/accusatory. I was curious if anything had changed recently and got these results. So basically bottom left corner. Nothing much has changed, it seems!